Co-chaired by Institute Diversity Vice President Archie Ervin and Student Life Vice President and Dean of Students John Stein, the Black Student Experience Task Force presented its 11 recommendations to President G.P. “Bud” Peterson in late spring 2016. All recommendations were approved and will be implemented over the next three academic years. These recommendations are grouped into four categories: programs; trainings; physical spaces; and planning and assessment. 1. Challenge – Expand OMED’s Challenge enrollment from 75 to 175 underrepresented minority and women students per program over the next three years. Challenge helps prepare incoming freshmen for a successful college career, both academically and socially, during a five-week intensive summer program. 2. FASET – Orient all new students and their parents, families, and guests to issues of diversity and inclusion and share campus resources that support Georgia Tech’s commitment to diversity. At least one new session at FASET will highlight the successes of underrepresented students, faculty, and staff at the Institute. 3. Intercultural Student Programs – Create and support collaborative intercultural student programs that foster interactions and learning among diverse student communities at Georgia Tech. 4. Reporting System – Create a data infrastructure or submission tool that allows students to submit information detailing any experienced discrimination on campus. Submissions would remain anonymous. 5. Community Orientation and Training – Launch online and in-service training for faculty and staff that addresses issues of gender and ethnic diversity, equity, and inclusion within the student experience. Following this training, faculty and staff will serve as ambassadors for an equitable and inclusive Georgia Tech. 6. Cultural Inclusivity Leadership Training – Expand and modify leadership training for leaders of student organizations to include modules on cultural inclusivity and managing student diversity. Incorporate these modules into GT 1000 classes and other opportunities. 7. Greek Education – Create a subcommittee of fraternity and sorority members who will plan programming on issues of race, gender, sexual orientation, and sexual assault for members of Greek Life. This subcommittee will also be tasked with evaluating the current state of Greek Life at Georgia Tech. 8. Multicultural Center – Create spaces where all students feel welcome on campus, in support of students’ overall adjustment and well-being. 9. 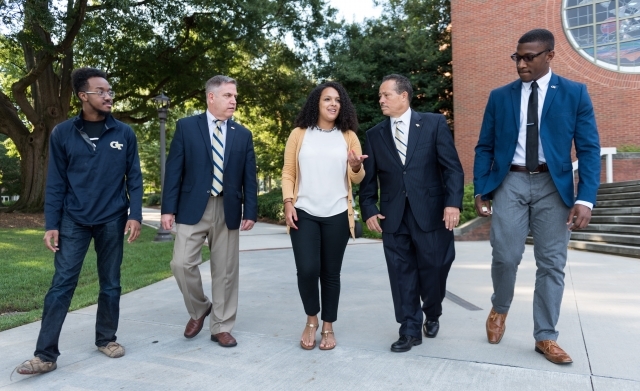 Strategic Plan – Examine how student diversity is operationalized through Georgia Tech’s Strategic Plan. Prioritize and fund proposals that enhance diversity, equity, and inclusion experiences for students. 10. 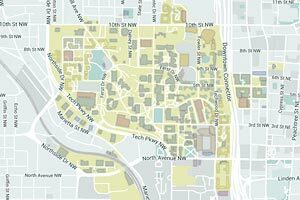 Campus Climate Assessment – Conduct a broad-based campus climate assessment by an independent entity to obtain a deeper understanding of the concerns and experiences of all students at Georgia Tech. 11. Institutional Climate Change and Growth – Establish a joint student advisory group to advise and recommend actions that enhance diversity and inclusion experiences among Tech students. Moving forward, an implementation team from Institute Diversity, Student Life, and Undergraduate Education will meet regularly to monitor progress on these recommendations. Additionally, the Student Intercultural Advisory Committee was established to offer guidance on diversity and inclusion and participate in these implementation meetings in the future. For any questions about the Black Student Experience Task Force and/or its recommendations, email institutediversity@gatech.edu.